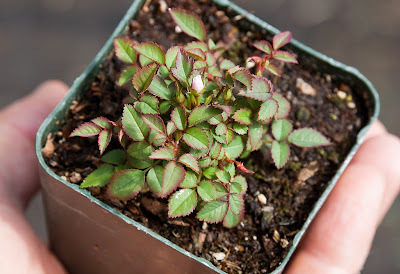 Paul Barden Roses: How tiny does tiny get?? I think it is the epitomy of exquiste! I also love how, even as a very young seedling, it seems to have a lovely, compact, vigorous, growth. It is my favourite rose colour! So, would you say this extreme miniaturism is a bad trait to be culled or a good one? I was thinking of using some of the smaller minis I have here in an attempt to tame more quickly such giants as gigantea, longicuspis, and bracteata. I have an unknown mini with tiny clusters of flowers that looks like 'Popcorn', however, the whole plant is not more than 20cm tall, the leaves barely 1cm long, and the flowers are not more than 2cm across ('Snow Carpet' might also be a good choice for this, hmmm). I am assuming it is diploid due to its diminutive stature. It produces boat-loads of pollen so was thinking it might be useful for this purpose??? The thinking being that the over abundance of dwarfing polygenes (because this is what I think it is... other genes 'working' in conjunction with dwarfing genes to modulate the expression of the gene. I guess homozygosity is also a big factor), would balance out and temper traits such as internode lengthening and foliage size. 'Magic Wand' is diploid too isn't it? I think this also exacerbates the miniaturism. "So, would you say this extreme miniaturism is a bad trait to be culled or a good one?" Well, Simon, I would say that depends on what you want to have happen. I believe miniatures can be very useful to "tame" larger species. If at all possible, make an effort to match ploidies in order to help maintain fertility, since odds are you will need to proceed at least one more generation before you have results you want. (And yes, as far as I know 'Magic Wand' is a diploid; its pedigree certainly suggests it) I have about 15 seedlings of a cross of R. bracteata X 'Magic Wand' this year, which, although developing painfully slowly, will hopefully provide a new race of Bracteatas that remain diploid and might prove useful in taking that kind of breeding in a new direction. Time will tell! If you want some open pollinated seeds from 'Magic Wand' at the end of the growing season, I will gladly send you some. It possesses exceptional Blackspot resistance (immunity?) in my garden, which is remarkable, really. I am hoping this characteristic won't be lost in breeding, if I select carefully. Your "Not Popcorn" sounds intriguing. I would definitely use whatever you have for breeding if its traits fit in with your plans. Just because you don't know its true identity doesn't mean it might not be extremely valuable in your work! Good luck. G'Day Paul :) That would be awesome! It's such a shame that we can't exchange material more freely... It's a very one-way street :( I'll blog some pics of my 'Not Popcorn' to show you what I mean. So how often would you say that you find something good with self pollinated seedlings. Is it very rare or does it happen enough that you are not shocked by it. 3) whether or not that plant appears to have ANY potential at all as a breeder. Paul, I was just looking at 'Magic Wand' on HMF (your whole plant photo is amazing) when I noticed one of the photos, by Margaret, is at Ruston's here in Australia.... so I'm on a mission now to see if it can be found... will let you know how I go. Are you planning to show the rose again after the bloom opens? Thank you for the pictures Paul. Always interested in seeing different sides of Magic Wand. That photo will be coming later today, yes. I will also include at least one of its siblings as well.